Would the life of police officer Allison McLean get a little less hectic in season two of the Ties The Bind TV show? We’ll never know. UP has cancelled the drama after one season of 10 episodes. This dramatic series revolves around a tough and experienced female police officer from Seattle, played by Kelli Williams. Like most working women, Allison McLean’s hands are already full, balancing a demanding and dangerous job and a family — husband Matt (Jonathan Scarfe), and teenagers Jeff (Mitchell Kummen) and Rachel (Natasha Calis). She and her partner, Devin (Dion Johnstone), must arrest her brother, Tim (Luke Perry), for aggravated assault. As a result, her world drastically changes. The rest of the cast includes Matreya Scarrwener, Rhys Matthew Bond, Lucia Walters, and Aaron Craven. After thoughtful consideration, UP has decided to not renew “Ties That Bind.” The decision was not made lightly as we appreciate our passionate viewers who were not ready for the story to end. We want to thank the cast and crew for their tremendous dedication. Your commitment to this series was extraordinary. What do you think? Did you enjoy this cop drama? Should it have been cancelled? 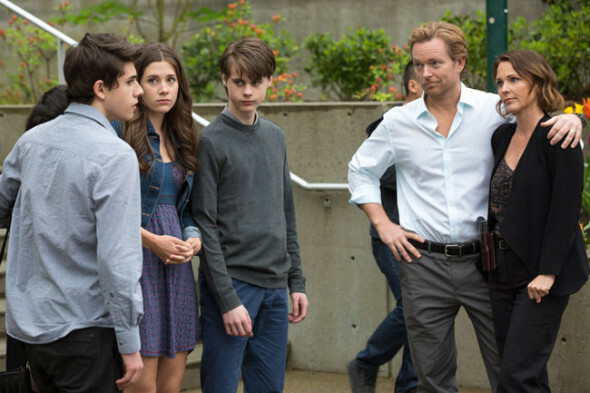 Would you have watched a second season of Ties That Bind on UP? More about: Ties That Bind, Ties That Bind: canceled or renewed?, Ties That Bind: ratings, UP TV shows: canceled or renewed? Very good family show. It’d be awesome to get to see more. Script was good, parenting was good, good marriage relationship: all very real in the ups and downs. The series was so good. Great cast, I just don’t get why it was cancelled.